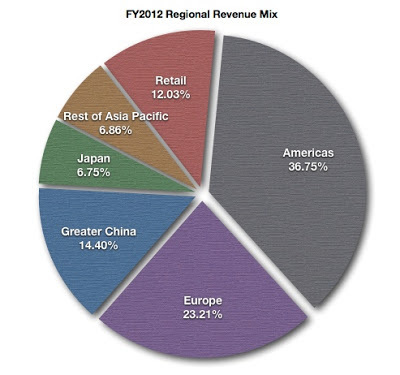 In FY2012, Greater China and Japan represented Apple's fastest growing revenue regions. Although the rate of growth in Japan during FY2012 was amplified by the severe economic impact of the tsunami in the prior fiscal year, it's interesting to note the iPhone is not currently available on the largest national carrier in either revenue region. The graph below illustrates the percentage of total revenue delivered by each of Apple's revenue regions over the most recent nine fiscal quarters. Over the period charted, the percentage of reported revenue delivered by Europe has been on a gradual decline while Greater China continues to deliver a rising percentage of total revenue. Japan also continues to deliver a rising percentage of Apple's revenue total. Due in part to expanded distribution of iPhone and iPads, the percentage of revenue delivered by Apple retail has also been on a slow decline. The consumer migration away from conventional PCs to iPads is impacting the performance of the company's retail stores. In the December quarter, Apple's inability to deliver sufficient quantities of its new iMacs may have adversely impacted retail store performance in the period. The graph below illustrates the percentage of operating income per revenue dollar in each of Apple's geographic regions over the the most recent nine fiscal quarters. Apple's fastest growing revenue regions, Greater China and Japan, on average deliver the highest rates of operating income per revenue dollar. As expected, the costs of operating bricks and mortar retail stores relegates the retail region to the lowest percentage of operating income per revenue dollar among the company's six regions. The retail stores are Apple's primary vehicle for product marketing and customer relationship development and have value greater than the percentage of revenue and operating income contributed to the company's overall performance. Necessarily, decisions concerning retail store site selection and geographic placement must be made carefully. At the end of the December quarter, Apple had 401 retail stores open for business with about 150 of the stores located outside the US. By adding Greater China as a distinct revenue segment, Apple revealed the comparatively slow rate of revenue growth in the Rest of Asia Pacific, inclusive of India and Oceania. As a region, the Rest of Asia Pacific delivered 8.47% revenue growth in FY2012 versus overall revenue growth of 44.58% for the company as a whole. In the December quarter, this revenue region delivered about 10.4% revenue growth versus about 17.7% revenue growth for the company as a whole. Exclusive of Apple retail with store locations around the world, the Rest of Asia Pacific has the lowest operating income per revenue dollar of Apple's revenue regions. Operating income per revenue dollar will factor into Apple's approach to growth in the revenue region. Apple manages its businesses by region and manages growth with margin in mind. In the December quarter, Apple refreshed the iPad with Retina display and introduced the iPad mini. The company also released a major refresh of its iMac personal computers and realized the first full quarter of sales of the popular iPhone 5 handset. The high costs of new product releases occurred in a quarter with the most challenging prior-year results for comparison purposes in the company's storied history. Gross margin in the current quarter will be no match for the record 47.37% gross margin outcome in the prior-year period. Due to unsustainably high gross margin in the first six months of FY2012, Apple will report negative net income and eps growth for the first six months of the current fiscal year. The sequential rise in gross margin commencing this quarter from the December quarter's 38.63% and extending through the March quarter of FY2014 will create a vastly different profit picture than the one that's painted today. Continued growth in Greater China and Japan are essential for net income and earnings per share growth recovery. Greater China and Japan are currently Apple's fastest growing and most profitable regions on a per revenue dollar basis. The eventual additions of China Mobile and Japan's Docomo as authorized iPhone carriers will spur growth in each of the two revenue regions. Managing for margin necessitates a deliberate plan for retail store expansion and continued expansion in the Rest of Asia Pacific revenue region. Analyzing Apple's performance on a regional basis provides insights into the company's approach to regional growth and overall geographic expansion.